Some have mistakenly thought this proposal would finally end the use of proprietary browser plugins like Silverlight and Flash. In reality, this would only make it easier for companies to achieve the same purpose via hooks in HTML itself. The difference would only be on paper; in practice, users would experience the very same unethical restrictions, platform incompatibilities, and device limitations as with proprietary browser plugins. The W3C can't stop companies from trying to use DRM on the Web, but it can certainly withhold its endorsement and make it clear that it won't help them do their dirty work. This petition has been deprecated. Thank you for participating! Tell the World Wide Web Consortium (W3C) and its member organizations not to embrace a proposal that undermines the very purpose of the HTML standard upon which the Web is built -- freedom. If you want to learn more about the myths around this issue, the Electronic Frontier Foundation has an excellent write-up which covers all of the misleading discussion around the proposal and how, no matter what platform or browser you use, this puts the Web as we know it at stake. 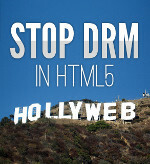 Read it here: https://www.eff.org/deeplinks/2013/03/defend-open-web-keep-drm-out-w3c-standards.